If your community has a market where Greeks, Turks, Palestinians or Lebanese people shop, you’re going to find good imported feta there at a great price. But my current infatuation is labneh, which I purchased in a tub recently at a Palestinian market in Berkeley. The brand is Ülker, and the label says it’s from Turkey. Many people describe labneh as yogurt cheese—basically, yogurt or Greek yogurt with more whey removed. You can make it at home by putting plain yogurt in a sieve lined with a double thickness of cheesecloth. Set the sieve over a bowl, put a plate over the sieve (as a cover, not as a weight) and refrigerate. Stop draining when the yogurt is as thick as sour cream—start checking after 12 hours —and stir in salt to taste. Labneh made that way will be tart, like fresh chèvre. My Turkish labneh is softer and barely tangy, like a cross between sour cream and Greek yogurt. Jale Boga Robertson, a Turkish friend, tells me that some people bake with it. I can’t bring myself to look at the calorie count. I bought some flatbread, made some dukkah—the Egyptian nut and spice dip—and picked up a bottle of just-released 2017 rosé. Any moment now, rosés from the 2017 vintage will be floor-stacked at your favorite wine shop. Buy a few to sample so you know which ones you want more of before they’re gone. 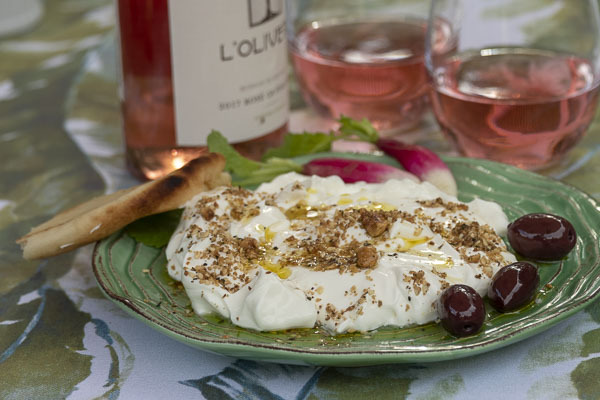 Spread some labneh on a plate; top with dukkah (homemade or storebought) and extra virgin olive oil. Surround with radishes, olives and warm flatbread for dipping. What a perfect spring appetizer—although I’d be happy to have it for my dinner. You can purchase dukkah in spice shops and specialty stores, but homemade is fresher. To save time, buy roasted unsalted hazelnuts (Trader Joe’s has them) and eliminate the nut toasting step. Preheat an oven to 350°F. Toast the hazelnuts until golden brown, about 20 minutes. While they are hot, wrap them in a clean dishtowel and roll vigorously against a work surface to loosen as much of the papery brown skin as you can. It’s okay if some skin clings to the nuts. Let cool. Toast the sesame seeds in the oven until golden brown, about 10 minutes. Let cool. In a skillet over medium heat, toast the cumin seed, shaking the skillet often, until it darkens slightly and becomes fragrant, about 5 minutes. Let cool. Toast the coriander seed in the same skillet until it darkens slightly and becomes fragrant, about 3 minutes. Let cool. Grind the cumin and coriander to a powder in a mortar or spice grinder. In a small food processor or chopper, pulse the hazelnuts until medium-fine but not pasty. A little texture is nice. Transfer to a bowl and stir in the ground spices, sesame seed, spearmint and salt. Time to “drink pink” and discover the cheeses that go best with the fresh, crisp, thirst-quenching rosés we love. Join me for this salute to California’s just-released 2017 rosés and the many cheeses that make these refreshing wines shine. Use these tasty pairings to kick-start your summer entertaining.